The Gathering drum can be played with the hands, sticks or mallets. Kids enjoy playing this big drum solo style but have the most fun when other kids (big kids too) join in the fun, inventing cool rhythm pattern all on there own. 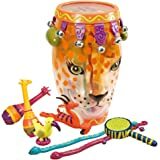 About Remo - The Remo Kid's Percussion Collection gives children exciting ways to make music and discover rhythm with their very own instruments. Remo Kid's Percussion instruments have received the prestigious Oppenheim Gold Seal Toy Awards for product quality. 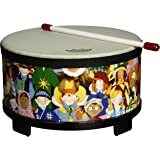 This colorful, 16-inch kid's gathering drum can be played with the hands, sticks or mallets. 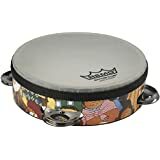 Kids enjoy playing this big drum solo, but have the most fun when other kids--big kids too--join in the fun, inventing cool rhythm patterns all on their own. The drum is made using ACOUSTICON shell material, for excellent projection capabilities and enhanced low-pitched fundamentals. Added benefits are strength, weather-resistance and reduced weight. The head uses the same material as Remo's FIBERSKYN 3 drumheads, for warm, full tones, with plenty of resonance and sustain. That may not concern your young player just yet, but nonetheless, they'll have a quality instrument for learning about rhythm, which is the foundation of all music making. 5.0 颗星，最多 5 颗星Which one do you buy? 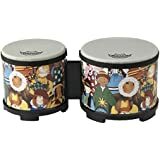 I didn't know which one to buy and went with the cheaper "rhythm kids" drum. With that one you get one drum "stick" and the drum sound is not good, so I bought the other one. 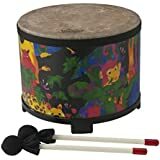 With the more expensive "rain forest" (taller and more expensive) drum you get 2 mallets and the drum sound is much richer; there is really no comparison. 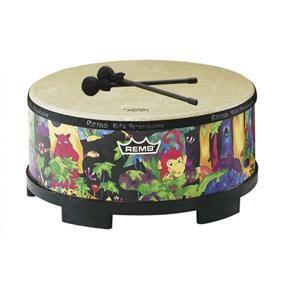 As an adult I enjoy playing the rain forest one but would never play the cheap sounding rhythm kids drum. The difference isn't only the mallet instead of the stick, the drum head is a far superior quality. I want to buy other remo kids drums but am afraid I would just get the tinny sounding drum head. The 5 star is for the rainforest only, rhythm kids gets 3 stars. 5.0 颗星，最多 5 颗星Tougher than Chuck Norris. Seriously. Buy this drum for your kids! 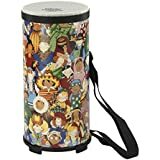 Function: Great sounding little drum! Kids will love it. Parents will learn to love it. Durability: We purchased this drum 8 months ago for our son's birthday. In that 8 months, it's been thoroughly enjoyed by our three toddlers. It's also been re-purposed and abused... and not just a little bit. A lot of bit. This drum has proven to be indestructible. In addition to providing hours of percussive goodness, here are some of the many ways that our kids have used this drum: Drum, shopping cart, car (for transporting dolls, bears and younger brothers), chair, foot stool, bowling ball, shot put, a hat, battering ram, drawing pad, a "shoe" and a trampoline. 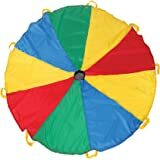 Other fun side notes: Drum is capable of holding copious amounts of water or other liquids, sturdy enough for when your kids try to learn how to log roll and it can withstand falls/tosses from decent heights. Additionally, if and when the drumsticks go missing, rest assured that this drum can be played just as effectively with wooden/plastic kitchen utensils, "Melissa & Doug Stainless Steel Pots and Pans" and/or hair brushes. Having endured all of the above, the drum is still in excellent condition and still sounds great. 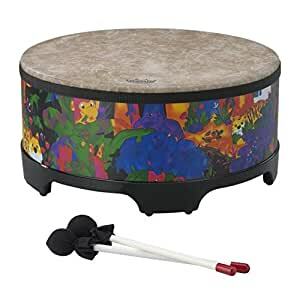 Summary: This is the best $36ish you can spend on a drum for your kids. They'll get tons of enjoyment out it and based on it's durability, it should last for a good long time. Remo did a great job with this one... Seriously. Buy it for your kids already! You won't be disappointed. People keep telling me that I was crazy to buy my kids a giant drum as a Christmas gift, but I find the tone of this drum to be really warm and not at all annoying. OK if they play it while we’re trying to have a conversation a few feet away, that can be frustrating, but for the most part I am not finding myself bothered by this drum at all. I even like to sit down and play it myself sometimes and I find the vibration of it to be really soothing. It feels really well put together and like it will last for a long time. My kids have been playing it a lot and incorporating it in to games. My biggest concern was that we would spend all the money on it and then it would not get used, but so far that does not look like it will be the case. 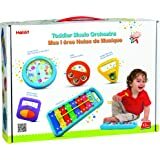 I am trying to use it to help my daughter positively direct her feelings when she is frustrated/angry and I’m going to ask their music teacher for some other cool activities to use it for. My only complaint is that I wish there were some choices as far as the color. I don’t think I would have chosen the rainforest print if given a choice, but it also doesn’t bother me. I think this was a great purchase!